Emotions are flying in the Middle East but it was business as usual in Bahrain. M went back to work, H went back to school. I was in two minds about sending her, not convinced that things had calmed down for good. But, after being cooped up in the house and in our compound for almost a week, we thought it might be good for her to get a bit of routine back. I told myself that if I got nervous, I would go and pick her up early but I managed to get through the morning without worrying about it. 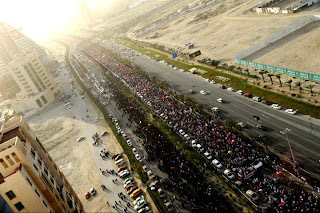 Then last night, there was a huge pro-Government rally outside the largest place of worship in Bahrain, the Grand Mosque (Al Fateh Mosque - named after Ahmed Al-Fateh, the conqueror of Bahrain - ironic?). Today's Gulf Daily News (pro-Government newspaper) reports that there were 300,000 people there. I'm skeptical as that's about half the local population, but let's assume there were. Surprisingly, no international news coverage, nothing reported on CNN, BBC and Al Jazeera (no surprises that Libya was the main story there). I'm guessing pro-Government rallies are not as interesting as demonstrations that call for the Government to be overthrown?? Bahrain TV did report, but their coverge was like something out of the seventies, really grainy and sometimes black and white, with background music that sounded so much like the title song from 'I Dream of Genie', that I wouldn't have been surprised if Barbara Eden had popped out onto the screen. Then today the school requested that we collect our kids earlier than usual and now we hear that the Anti-Government protests are going strong this afternoon and will be even more fervent tonight, as a prominent Shiite leader is set to return from self-imposed exile after it was decided by the ruling Monarchy that a long running terrorism case against him would be closed. I reckon Hell hath no fury like an exiled political leader returned, so I'm pretty certain that there's more noise to come. But whatever happens, it does at least seem that the Monarchy is engaging with the protesters and dialogue has been opened. Whether the discussions go anywhere is anyone's guess. Protesters are apparently suspicious about any offers of reform as promises have been made in the past and few have come good. A week of demonstrations comes at an economic cost too. The Bahrain Grand Prix scheduled for early March has been cancelled. I'm sure the Australian Grand Prix organisers are saying 'cha-ching' - Bahrain's loss is their gain as Melbourne Grand Prix will now be opening the F1 2011 season. There are a number from both sides of the political spectrum who are saying that it's not about sectarianism. It's about everyone being just 'Bahraini' - nothing more, nothing less. Reminds me of an (ongoing) recently re-ignited debate in Australia about multiculturalism and the fact that it's important to celebrate differences, but in the end, to be united under one national banner. Please note - I'm not taking sides on this political issue. This is not an issue that concerns me or any other expat. This is an issue for the Bahraini people. I am merely providing commentary as an expat, about what I see and hear, and piecing it all together for all at home. Your perspective, and the parallels with the current Australian situation are very interesting. Hope it settles down- the uncertainty must be hard to work around.